Cosy wheat bag presents are popular presents at this time of year, but can be lethal if you don’t follow the instructions properly. At this time of year, a warming wheat bag can be a soothing solution to winter chills and stiff aching joints and muscles. Wheat bags may bring comfort to the user, but they can also be a fire risk if not used properly. 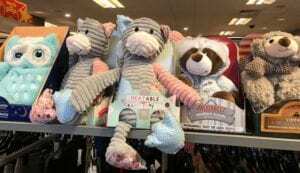 They are extremely popular presents, particularly for older people and children – please ensure you think carefully before buying them, so you don’t put those you love at risk. Most people perceive wheat bags as being a safer alternative to hot water bottles and have no idea how dangerous they can be. They are horrified to hear that these comforting little bags have caused people to die. In fact, fire fighters have been forced to issue warning about the dangers of not using wheat bags correctly, after several people have died in fires directly attributed to these bags. Cheshire Fire and Rescue are one service that produced safety guidelines for using wheat bags in the hope of reducing the fire risk and the risk of burns. Follow these safety steps to keep warm and safe this winter. These usually contain buckwheat that has specific moisture content. Knowing the moisture content, plus the volume of the wheat bag, allows the manufacturers to give exact guidelines as to how long the bag can be safely heated. If you stray from these guidelines you could cause the wheat bag to overheat. This could either result in a fire or burn your skin. Buy from a reputable company offering clear heating instructions and their contact details in case you have any problems. Always follow the manufactures instructions when heating up a wheat bag. Factor in the wattage of your microwave – the higher the wattage the quicker the bag will heat up – and the length of time you are heating it for. Be careful not to heat it for too long OR on too high a temperature. Never heat for longer than the recommended maximum. This is usually 3 minutes for manufactured bags. Be aware of an over cooked smell – like burning, charring or smoking. Never leave the wheat bag in the microwave unattended. Home made wheat bags can pose a greater injury and fire risk since the exact moisture content of the bags isn’t known, nor is the volume. This means that proper heating time cannot be recommended. Using alternative fillers for wheat bags other than buckwheat can be more dangerous and further increase the risk of fire or injury. Although it is tempting to use essentials oils to add soothing scent to your wheat bag, it is not advisable. The oil content builds up on the bag over time and can increase the fire risk. The problem centres on the wheat bag’s ability to absorb and store heat. This can then lead it to overheat. So do use the wheat bag as a heat pack for the body, but don’t use it as a bed warmer. Covering it with bedclothes, such as duvets or blankets can lead to it spontaneously heating up and it may catch fire. This issue has been directly responsible for the death of quite a few people. Wheat bags can also overheat and catch fire if left in direct sunlight. Once you have heated the wheat bag, do not reheat it again until it has completely cooled. This could take up to two hours. Continual heating of the wheat bag can lead to it becoming dryer which can increase the risk of it igniting. Putting a cup of water in the microwave when heating the wheat bag can reduce this risk. Do not store the wheat bag until it is cold. Leave it to cool down property in a non-combustible area such as a sink. Should be given to wheat bags given to children (and to older people). These are offered as a comfort for night-time and are often cartoon characters, teddy bears or soft toys. Be aware that when heated in a microwave where the turntable doesn’t work properly, the bag may develop hotspots that can cause burns. Always check the wheat bag carefully before giving it to a child or older person and please comply with the other advice within this article. When used properly they can indeed be lovely, warm and soothing.